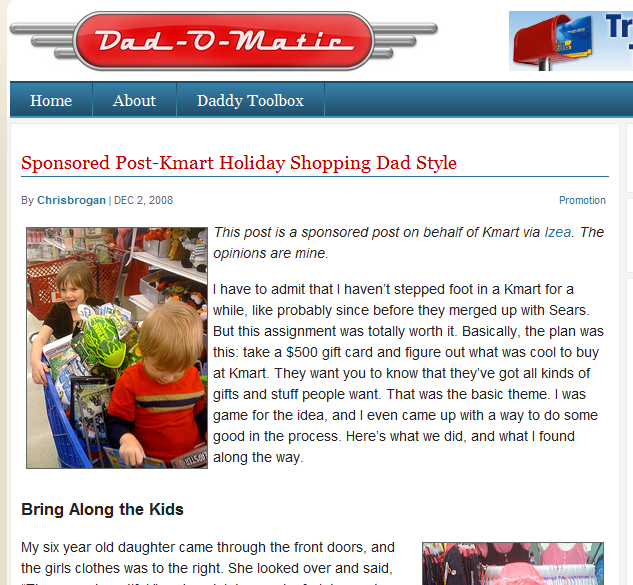 This isn’t another post about Chris Brogan’s Dadomatic blog. That subject has been capably covered by others, including Scott Henderson, Jeremiah Owyang, Ben Kunz, and Chris Brogan. Robert Scoble asserted yesterday that it’s improper to mix editorial and advertising and to accept fees from sponsors to create editorial content. As you will see below, Scoble’s claim reeks of hypocrisy. I have my opinion about the subject, but here was a great opportunity to engage Scoble one-on-one and discuss a hot and important topic. But Scoble’s statement wasn’t hypocritical for the reasons you think. 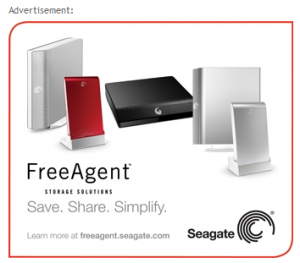 I don’t fault him for taking ads from Seagate. 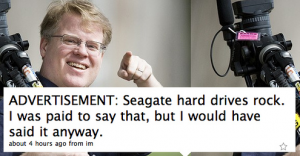 Seagate has been a true friend to Scoble and has supported him for years. They’re a good company – I’ve bought many of their products. Scoble’s review of Seagate’s new wireless portable device vs. Brogan’s review of Kmart. You can reach your own conclusions. And in case you wonder whether that was Scoble’s only “editorial”, it wasn’t. You can find plenty more, including here, here, and here. 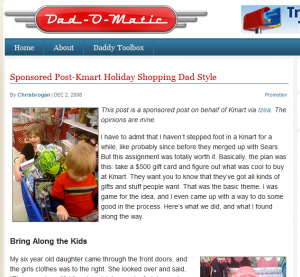 This post isn’t about whether sponsored blog posts are appropriate. It’s about hypocrisy. If you get on a high horse, claim to speak authoritatively, and point fingers, it generally helps if you are not pointing them at yourself. First of all, I wasn’t “attacking” Chris Brogan at all. If you thought I was, you aren’t reading my posts very clearly. He did nothing wrong, other than to sell his name out too cheaply. #1 Seagate doesn’t pay me to “post.” They don’t ask me to take editorial positions. As a sponsor they get their name on the beginning of the show. You should see Allen Stern’s writeup on the whole thing, I wonder how many of these bloggers would go into a Kmart or a Sears on their own and write effusively about the experience. #2 Seagate pays me enough to make a living wage. There’s no way anyone is going to make a living wage at $500 a post. Yes, it’s nice to buy a toy at Christmas time, but how are you going to make a good salary and buy medical coverage and all that doing that? I’d rather bloggers see the huge value they have in front of them rather than trying to sell posts like that.